Alpha is a 2018 American historical drama adventure film directed by Albert Hughes, with a screenplay by Daniele Sebastian Wiedenhaupt, from a story by Hughes. The highlight of this film is its arresting imagery. Albert Hughes, directing for the first time without his brother Allen (with whom he made such films as Menace II Society and From Hell), clearly relishes the chance to create a wide-screen adventure epic set during the Late Stone Age; he surveys every landscape, skyline, and texture with an almost fetishistic glee. Every expected image—a volcano, a total eclipse, a bird's-eye view of a bison herd, stone formations in silhouette—is fawned over and presented as dreamy, mythic, otherworldly, and sumptuous. Hughes also admirably opts to have his characters deliver their rudimentary courage-and-family dialogue in an unidentified prehistoric language, which seems courageous for a big-budget, studio-financed picture hoping to draw in a family audience. The story itself is all right, if predictable and a bit...underdeveloped (at times the details of the protagonists' survival are elided in favor of striking helicopter shots and a swelling orchestral score); people's mileage will vary regarding the man's-best-friend-origin story elements, which range from engrossing to cute to saccharine. 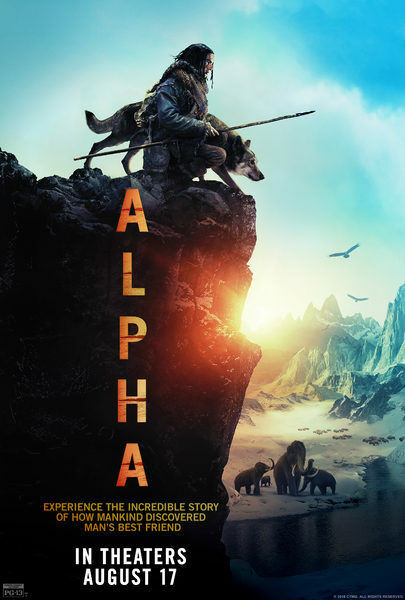 Alpha is a nice survival film with a pleasant human-animal dynamic. It's also not really outstanding in that regard though, but the views of nature are. It's 20,000 BC setting and the scenery are beautifully shot and it fulfills with amazement of what the purity of the Earth must have been like back then. Besides this, the story flows along in non-surprising ways, not very exciting but not dull either, the bond between Keda and the Wolf grew on me.